Setting up Glamping or a pop up café? Boldscan can advise on design and finance for a Glamping business, as well as setting up, equipping and maintaining the sites. Boldscan’s Albion Canvas Range (in its 21st year) includes a range of premium quality tents, from traditional Safari to futuristic Geodomes and classic Bell tents. The Clubhouse, a quick and affordable solution for a café, shop or wedding venue completes the range. With the latest in-house printing technology for interiors and a wide range of signage, theming is simple and effective. Glamping is proving very popular for those who want an idyllic holiday away from the high tech world. The Glamping business model is providing a sustainable and lucrative income stream for landowners, zoos and holiday parks looking to diversify. Sites charge up to £1,500 per tent per week in peak season, with bookings running up to two years in advance, and occupancy in excess of 90% for the Easter to October season. Specialist Glamping equipment and signage manufacturer, Boldscan, has the inside track on what works, having set up over fifty luxury sites around the country and abroad. Clients include Longlands in Devon, Knaveswell Farm in Dorset, Welcome Meadow in North Devon, Middle Stone Farm in Somerset and The Gathering at the start of the Pennine Way, where Alan Wenham, chief designer, developed the first purpose built wheelchair friendly tent. 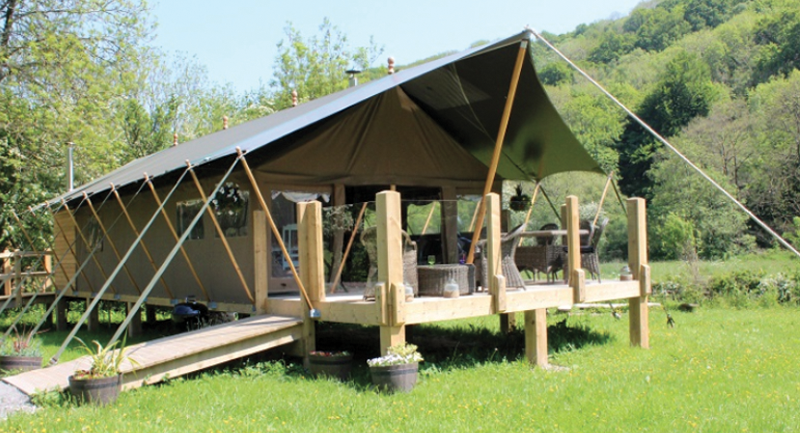 Holiday Parks, including Trevella Park and Perran Sands in Cornwall, plus Chessington Zoo and the Durrell Wildlife Park in Jersey have also successfully invested in Glamping areas within their parks. In addition to a range of tents from classic Safari and Bell to futuristic Geodomes, they have just added the contemporary Etosha, reminiscent of a cool Mediterranean villa, and the Kora, a mini safari tent just for two. Boldscan has also developed a wood burning range to generate heat and cook a roast dinner. The tents are hand made in their Somerset factory using high quality British canvas. Boldscan’s multi-purpose Clubhouse has ticked the box on budget, versatility, aesthetics, quality and timescale for a wide variety of notable enterprises including Quickes Cheesemakers, Knowsley Safari Park, Twycross Zoo, New Forest Water Park and Cambrian Birds.